Native Instruments Traktor Kontrol Z1 DJ Mixing Interface DJParts - All Variety of Parts that DJ Needs. 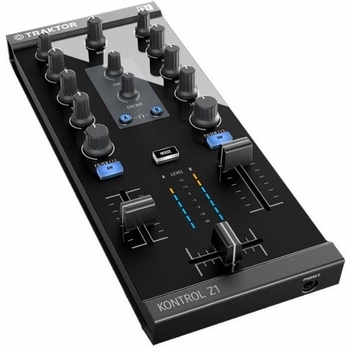 Native Instrument’s Z1 DJ mixer works perfectly with Traktor Pro 2 – plug in and instantly start mixing with hands-on control and premium, club-ready sound. You can also expand your mobile rig with additional creative possibilities: Add Traktor Kontrol X1 to control effects, loops and transport functions like play and sync, and Traktor Kontrol F1 for creative Remix Deck magic.